Peace and Quiet Return…at least for awhile! Today marks the final return to my sort of ‘acquired’ living style, pre-Thanksgiving holidays. Finally, my husband has returned to his work after vacation, my middle son is back at tech school and my youngest is feeling well enough to return to middle school after battling a mild bout of pneumonia. That leaves just the cat & I!!! Woo-Hoo! It is a rare and valued thing to enjoy such peace and quiet here (don’t get me wrong-I love my family and all their ‘sounds’, actions, idiosyncracies, etc. ); it’s just that, being an only child for so many years, one gets to really cherish a little peace and quiet now and then. I’m not sure, yet, if I will be getting my grandson today (think it’s a no…think his mom is ‘off’ of work today, but haven’t heard from anyone about it), so if that answer is a ‘no’, then I will (hopefully) be able to bask in the warm fuzzies of peacefulness until around 10:45 when middle son returns from tech school (that’s about an hour away, right now). He’s already given me a ‘heads-up’ that he’s bringing his girlfriend over for the evening, so that made me re-think dinner (not that I cater to people, just want to make sure we have enough food for 5 people, instead of the usual 4). Am thinking it might be spaghetti & meatballs with garlic breadsticks and some sort of vegetable but then…you didn’t really want to read my menu for the day, did you???. Enough of the daydreaming here, lots of housework/laundry to catch up on. After a week plus of entire family here, it REALLY needs a good straightening, cleaning, putting things away, etc. (not looking forward to that). On the knitting front, got another afghan done-that makes 5 now for the next Ghana trip. Spent part of yesterday trying out a new pattern, just for kicks. It was a knitted bookmark pattern that looks like pine trees; not a difficult pattern, just difficult if you’re trying to count stitches and rows and two of your sons are having a discussion/argument/escalated discussion, etc. over video games. Ended up almost ripping out most of it out of utter frustration…couldn’t keep my mind on what I was doing while listening to them ‘go at it’ 3-4 feet away. Finally just thrust it down and came back to it later…success, finally finished the square. Every once in awhile I just like to ‘keep my hand in’ the knitting of squares. I enjoy the challenge of trying out new patterns to see how they work. I don’t include them in the list of stitch patterns on the other blog, though, as they are usually someone’s copyrighted patterns, but they’re fun for me to stretch my knitting abilities. Our weather here in mid-Michigan has been a typical ‘Thanksgiving’ weather-today got up to a balmy 32 degrees with nice, thick frost/ice on the car windshield…fun. I’d forgotten the utter ‘joy’ of having to quickly scrape your way through a thick chunk of ice in order to be able to scratch out a little peephole to see with in order to drive youngest son to school! Ah, the joys of winter…NOT!!! There’s a light layer of snow on the ground now, probably about 1 1/2 inches…nothing to sniff at here….we’re hardy people used to those sudden downpourings of good old wet, white stuff called snow. Monday found me quickly getting my grocery shopping done because there was tons of that wet white stuff coming down. Got done shopping in less than an hour and came out to a car covered…had to scrape and brush off all the snow to get going again. Yep, it’s winder here in good old jolly Michigan! Anyway, friends, hope you are enjoying whatever ‘day’ you are having; hope you’re warm, cosy and comfortable with enough food in your tummies to make you happy and content…if only for this one, brief moment! Here we are at “the day before” Thanksgiving. I’m sure, for many, that means either more shopping for groceries or beginning preparations of much longed for wonderful holiday meals. Here at my house it means a day of rest for me. I’m not babysitting today, my turkey is defrosting in the refrigerator, all foodstuffs (to my knowledge) have been purchased so that leaves me free to ponder many things. My blogs came to mind and I did a quick review of my other blog: the Ghana Project. Did you know that, thus far from April to now, I have received 551 squares and several completed afghans? That means enough squares to complete 18 afghans with some to spare! I am overwhelmed with gratitude at the level of generosity of people and I am humbled. Thank you, to each and every one who had a part in this project. 29 completed afghans were sent to Ghana at the beginning of this month AND the work continues! I’ve been working on assembling more afghans for the next trip to Ghana sometime next year. Thus far there are 3 completed afghans and one awaiting a crocheted border (going to do that today). There are donated squares enough right now for at least another 3 afghans, perhaps 4 … that is awesome! I’m grateful, also, for this nation in which I live. You might be discontented with our politics, but we are FREE to worship without fear of being beaten or arrested; we are FREE to state our political views; we can VOTE for people running for political offices. (I didn’t mean to turn this into a soap box). I’m grateful for my husband having a job which enables our family to live in a comfortable life style (no, I didn’t say luxurious…we are ‘comfortable’…not wealthy, not lavish – middle-class average, if you will). I’m grateful for my little family: my husband, 3 sons and 1 grandson. Many years ago I prayed and asked the Lord for two things: a husband who would love me, and children. He granted those prayers and I am eternally grateful. I’m grateful for many friends, whether those I know personally or those I’ve met through the internet. You have touched my life in many ways, and I’m grateful. I’m grateful for my health; at 59 1/2 I’m doing quite well. I’m able to get around and do the things I love doing. The Lord has blessed me in this area, and I’m grateful. As we approach this year’s Thanksgiving Day, may all of you have SOMETHING you can be grateful for…even the small things…breath, being able to walk unassisted, being relatively healthy (even if only just for this one day). Life is such a blessing; may we ALWAYS have SOMETHING to be grateful for! It’s amazing how quickly a few words can transport me back to about 7th grade. Do you remember 7th grade? The teasing, unrelenting torment by other kids who are very sharp tongued? Today was my first direct dealing with public school youngsters; remember this is the first time I’ve put any of my children in public school? My youngest (8th grade) forgot a book at school and we drove back for him to get it. As we pulled up to the front of the school there were several small groups of kids standing outside waiting for rides home. It was a nice day out (50’s) so I had my windows down. As my son got out of the car and walked into the building I heard one boy yell something like: “Oh, there goes …..” (totally trashing our last name). I will say here that our last name is long and German (not, of course, wanting to print it here in public view for safety’s sake) and could, if desired, be totally mis-pronounced. This young boy wasn’t mispronouncing it, he was totally using it in a vulgar way. Under normal circumstances, a sane adult would have ignored it…but I’m not always a sane, together adult, and this verbal jab instantly transported me back to 7th grade with all it’s ugliness intact. What did I do? I chose to loudly say: “Excuse me, his last name is …..” Well, as you can imagine, that did absolutely NO good at all and within a nanosecond he fired back several MORE insulting mispronunciations of our last name. I can’t begin to tell you how many insults came to mind, each escalating as his verbal jabs (and other boys who, by now, had decided there’s strength in numbers chimed in) hit home. I vaguely remember tossing out something like: “Well, I thought YOUR last name was something else, too…but I’ll be kind and not repeat it!” (Oh, Pammie! Do you not know when to QUIT???) Of course, luckily, my son came out around that time and got into the car. Following his footsteps were more insulting verbal jabs hitting his backside. I had to apologize to him for what he will probably endure tomorrow and the following days all because his MOTHER couldn’t keep her cool! Sigh…..
On the other side, my son said: “Why DIDN’T you say what you were thinking?” My answer: “Because I’m SURE that they would be able to use much worse words on me, laced with great amounts of swear words.” These kids have NO sense of propriety if they easily feel that they can insult an adult they don’t even know! (how innocent I must sound to you, dear reader) I grew up in public school, so it’s not that I’m totally ignorant; just shocked at how far down the levels of filth can go when it comes to young kids today. I find it very sad. ps: I must say, I give great credit to ANY adult who can work through that kind of environment. Mrs Dof…that means you! Kudos! 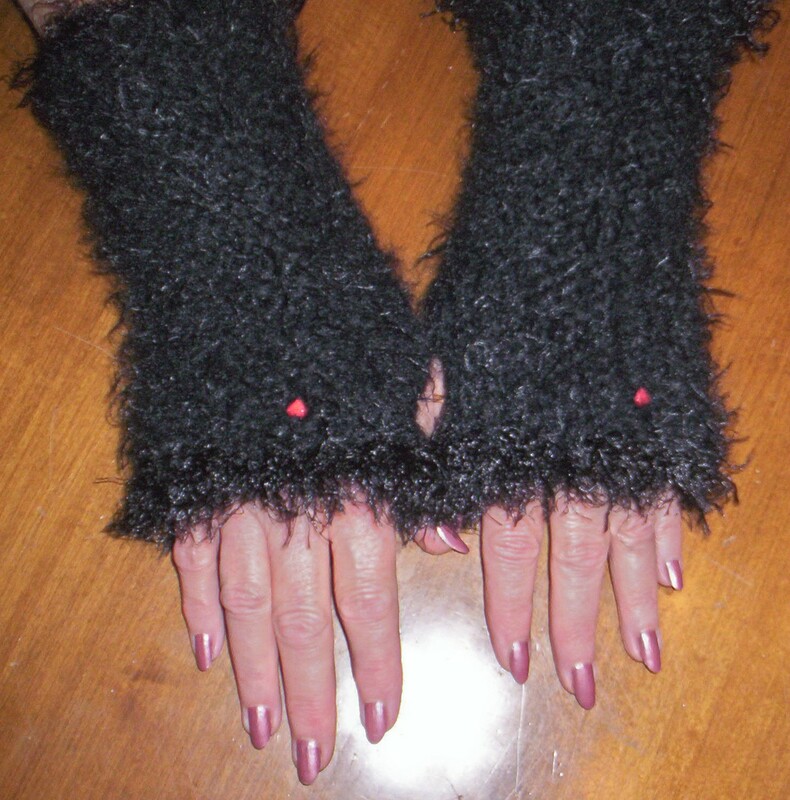 Today was my “off” day from babysitting my dear grandson, so I used it wisely to finish two sets of fingerless gloves which will be Christmas presents for young ladies (one is 18, the other 20). For once, I’m able to show you a project photo right after it’s completed! Guess our cat decided it was time to eat! Not much else going on around here; crocheting the border on the first afghan for the next Ghana trip, sometime next year. Organized squares for the next afghan, once I finish crocheting this one I’ll start assembling that one. In a short while have to get dinner started (“Potatoes O’Brian”: hash brown potatoes with green peppers, mushrooms & onions, cooked together with hamburger until it’s all cooked, then topped with lots of shredded sharp cheddar cheese! It’s a heart-stopper, but we all love it every once in awhile). Tonight is Night 2 of our church’s prophecy conference. Dr. Bob Shelton is speaking on the End Times & the Book of Revelation; my favorite topic. Our church combined with another Baptist church in the area to hold this one-week conference, so it should be packed. Last night was at the other church and it was pretty filled. Tomorrow night is my Knit group, so I won’t be able to go but I already asked if they were going to make audio tapes of the sessions and they are (Yay!). This is going to be a week of fast dinners, since the guys are going to be kind of hanging out without me! Weds. night is Friends Group (my Special Needs Adults group); Thurs. & Friday are conferences (plus babysitting) so I’m guessing by Saturday I’ll be more than ready for a BREAK! Hope life’s treating you well! Catching a few minutes of ‘rest’! It’s been pretty busy around here lately with babysitting my grandson; my oldest son’s job hours have increased, thus my hours have increased to 5 days a week, 5+ hours a day (and some evenings). To say that this Grammie is pooped out by the day’s end is putting it mildly, hence my not writing here much lately. He’s a very active little 1 year old and loves to keep me hopping! It snowed some today-wouldn’t be Michigan without the sudden change in weather. It was 40 something yesterday and then 30 something today with rainy-snow blowing all over (not sticking to the ground though, and that’s just fine for me!). I’m NOT a winter person, so this just increased my dread for what’s coming; I’ve heard it’s supposed to be a pretty severe winter (we’ve been expecting one for about 3 years now, so we who live here regularly, get to know that one’s definitely DUE!). Not much else here, been keeping busy knitting squares and trying to catch up on the knit stitch examples on The Ghana Project site. 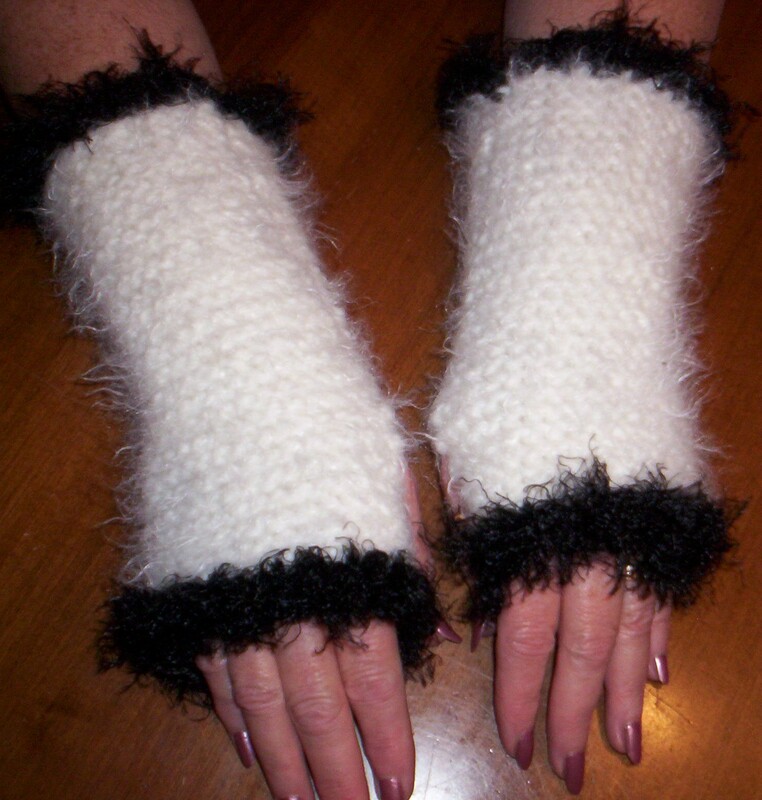 Have decided to try to knit another pair of the fingerless gloves AND an ear warmer for my grandson’s mother (she’s 20), so I picked out a nice fuzzy white yarn and will trim the top & bottom of the gloves in a black eyelash yarn. Hopefully, if I have time, I’ll post the finished photos. A lot of things have sort of gone on the ‘back burner’ with all the babysitting…I’m quite simply ‘too pooped’ to do much after ‘running’ all day with the baby. Why don’t I remember how hard it was being a new Mom, back when it was all ‘fresh’? (Guess that’s one of those things Moms tend to try to forget! If they didn’t they certainly wouldn’t be so eager to be Grandmothers!). 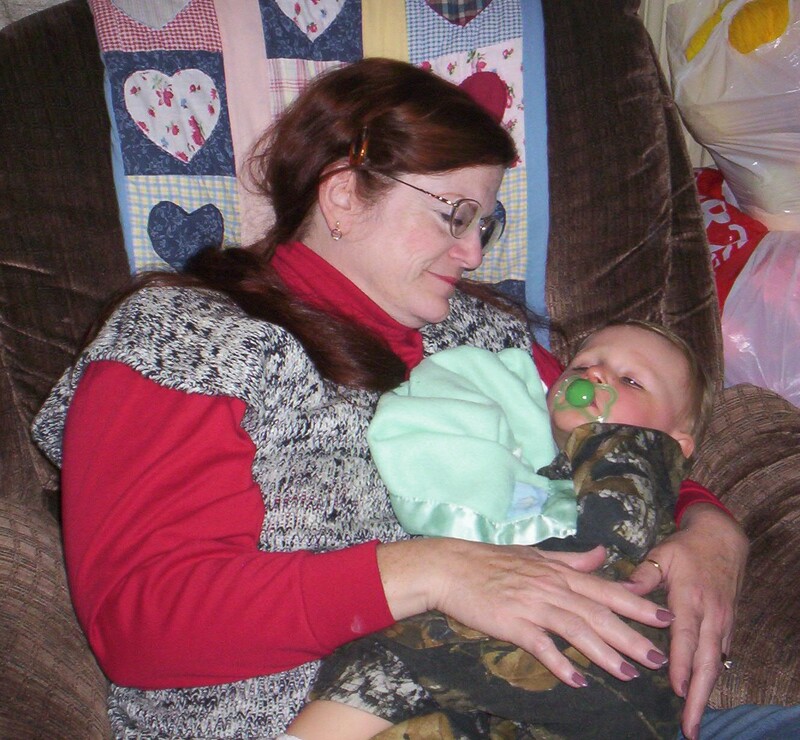 Well, folks, THIS Grandmother is headed to bed-baby’s coming at 8:30 a.m. and I need my ‘beauty sleep’!